Is Fort Hayes Shot Tower in Columbus, Ohio haunted? Fort Hayes Shot Tower was built over a period of just under 9 years between 1960 and 1969. It is also referred to as the United States Barracks or Columbus Barracks. 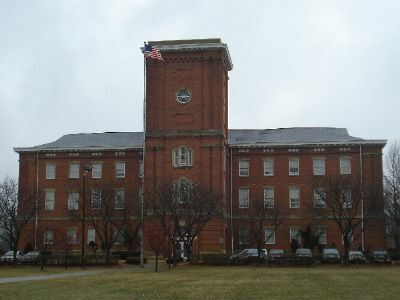 The tower was built as part of Fort Hayes military compound but now functions as an alternative-type high school. It is said that in the year 1865, a solider was killed by an overheated cannon fired for Abraham Lincoln's funeral train's passage through Columbus. A rumor has it that the soldier was actually killed by his commander, whose daughter he was in love with. Claims have been made by various students and visitors of the school of the sight of an apparition within one of the towers rooms wearing a soldiers uniform and having a sad expression on his face. There is also said to be a ghost in a World War Two uniform that haunts the school that has been spotted roaming the corridors and disappearing into thin air. Fort Hayes also happens to be surrounded by some great abandoned buildings from its military days which are also said to be home to various spirits.